Here is a list of the six best portable electric shaver choices. We’ll briefly describe each shaver, list a few pros and cons, plus tell you what you get for your money. Your list is in reverse order according to customer rating, ending with the highest overall rated shaver. 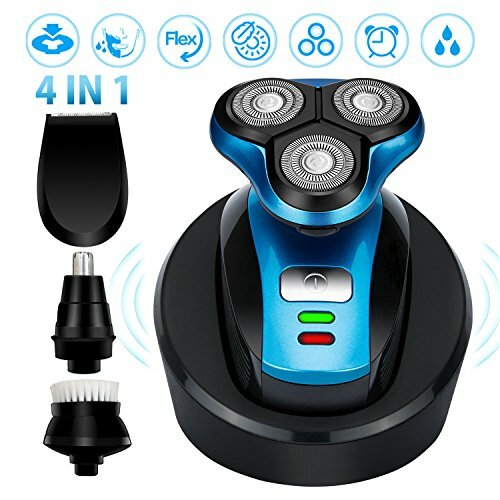 The first option for best portable electric shaver is a 4-in-1 rotary shaver. This is a completely waterproof shaver that also has a wireless charging system. The wireless charging system means it is easy to get a charge into this shaver. This is a fully waterproof model, so you can shave in the shower, and then quickly rinse your shaver clean at the sink. The IPX7 has a unique triple floating head that helps avoid electric razor burn and chaffing. It has a little larger head and a different handle shape than other portable shavers. It doesn’t take up a lot of space, but more than normal travel designs. Product Dimensions: Handle is 3½ by 3½-inches with a 2½-inch head. Shaving System: Floating rotary head. Wet and Dry: Yes – fully waterproof. Bearded or beardless shavers will be able to get a lot of use out of this portable shaver. The 4-in-1 design allows you to not only clean shave, but trim and sculpt. Braun is known for making some of the longest lasting, high-quality electric razors. The M90 is small and lightweight. It runs on AA batteries and can hold a full 2-hour charge. The shaver is small and lightweight. It will fit in your pocket for quick cleanups in an instant. This choice for the best portable electric shaver model has a precision trimmer. You can use the extendable trimmer for longer hairs, and also precisely sculpt your sideburns and moustache. The convenient twist cap helps to protect the foils, but twists to one side in a snap. You can wash this razor under the sink, since it is waterproof. The foil shaver design can take more swipes to clean heavier beard growth away. Product Dimensions: 5-inch handle with a 3-inch wide shaver head – weighs 3.2 ounces. Wet and Dry: Yes, and waterproof as well. If you travel a lot, this is an excellent portable shaver. It doesn’t have a long charger cord, but it’s excellent as a second electric shaver, or one that is used mostly for travel purposes. 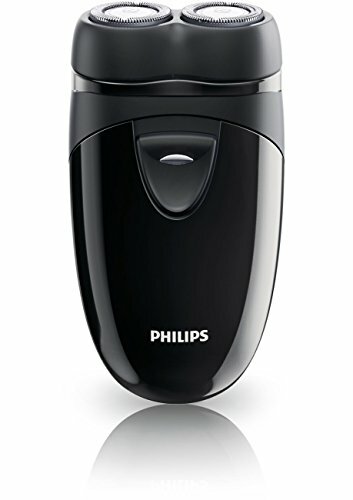 Philips Norelco is a leader in shaving products. This model is a perfect sized, portable travel razor. It’s lightweight, with dual heads for a close shave. 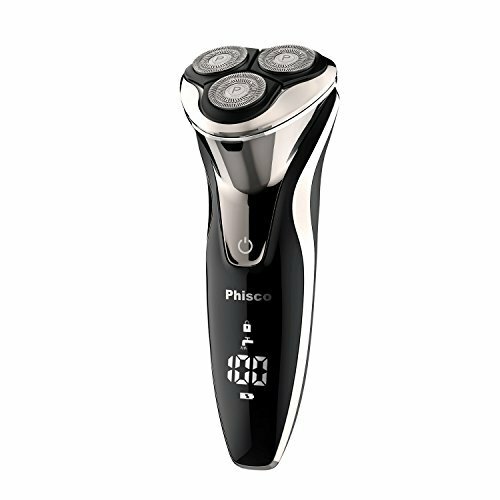 There is also Philips’s patented self-sharpening design that means you’ll get a clean, close shave every time. The self-sharpening feature keeps the razor heads in tip-top shape for a close shave. Each of the dual heads floats independently to help prevent burning and chaffing. 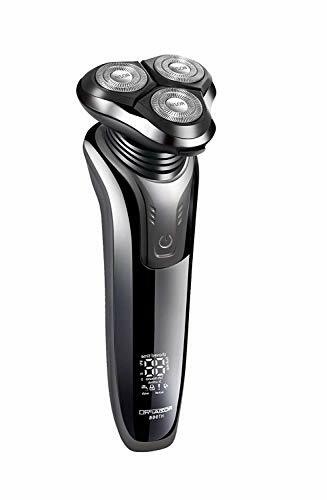 This choice for the best portable electric shaver has a 45-day money back guarantee, plus an excellent 2-year warranty. There is no way to recharge this shaver, unless you use rechargeable batteries. It requires two AA batteries to operate. Product Dimensions: 3½-inch handle – weighs less than 6 ounces. 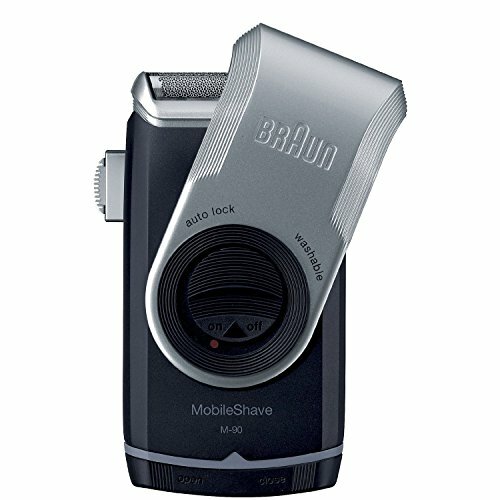 This shaver is perfect for people who are frequently on the go. It is a small and lightweight cordless shaver, so you can get a quick shave in almost any situation. You’ll need a pouch to carry your portable electric shaver, so try one of these shaving kits that come together with very stylish bags. This is a wet and dry shaver. You can use it when you take a shower even in the shower, and clean it up easily in the sink. There is a smart travel lock to help avoid the shaver accidentally turning on in a suitcase or overnight bag. The LCD display gives you an ongoing battery level indicator. It takes a full hour to recharge the battery. There isn’t an option for a one-time quick charge. Product Dimensions: 5-inch handle – weighs less than one-pound. All types of shavers, from beginners to the full bearded person who want to sculpt. There aren’t any attachments for other grooming projects like nose and ear hairs. The next shaver tackles four different projects with one razor. It is portable and cordless. There is both a USB and AC charger in the package. You can shave, sculpt your beard, or trim your nose hairs. 4-in-1 wet/dry portable razor to tackle multiple beard and face cleanups. You can plug the razor in for a 5-minute quick charge, which is enough to get one full shave. There is a key locking function, so you can secure your razor and prevent accidents. The battery is a special type. When it begins to fail frequently, you must replace it with a battery from the company. Other types of batteries will not work, and will also void the warranty. Product Dimensions: 4-inch handle and 1-inch triangle head. The shaver is great for all beard types. It is the perfect choice for individuals who want extra grooming features in their portable razor. The best portable electric when it comes to customer ratings. In fact, the overall score was next to perfect. It is a 4-in-1 waterproof, wet/dry portable razor from RoziaPro. You can use the USB fast charger to be ready to shave in just minutes. There is an easy-to-see LED charge indicator. This shaver has an estimated run time of an hour. The RoziaPro has a double-blade cutting system for the closest shave possible. 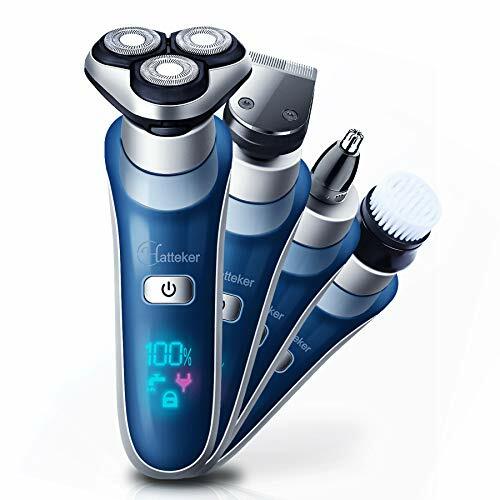 This is a more expensive choice on your list of the best portable electric shaver models, and the charge time estimate is an hour and a half. This is a good shaver for new users. It has excellent versatility as well. Being a 4-in-1 system, you can shave, trim, shape and even address nose and ear hairs in a snap. These are the six best portable electric shaver choices for 2018. Each will provide a good shave, even if you’re on the go. You can use this list to pick the one you think is best for your needs. If you’ve used any of these portable electric shavers, let us hear about your experience. In addition, if you think there is a shaver that we missed, tell us about those as well.